On the evening of Wednesday 16th March Tiger in A Tutu leaped and pirouetted for an epic book launch at Waterstones Covent Garden. A children’s illustrated book written and illustrated by Fabi Santiago. The story follows Max, a dancing tiger who wants to follow his dreams to be a ballerina. I met Fabi, who is originally from Brazil, when we both worked at Reward Gateway. Fabi later left and started a new journey by moving out of London to study a masters in illustration at Cambridge School of art. In 2014 it was also a great pleasure for me to visit Fabi’s exhibition of illustrations, including the Tiger in a Tutu – before it was a complete book. The book is dedicated to Fabi’s daughter and mother, who are both in Brazil, but on the night Fabi had the full support of her Sister and childhood friends, not forgetting her partner. In the children’s section of Waterstones, the perfect setting, the Tiger in a Tutu team had props including tutus and tiger ears. Tea cakes and Champaign all the guests were entertained. 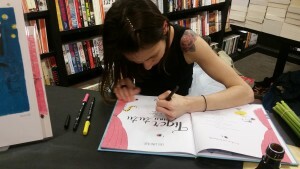 With the support of her friends and family Fabi read extracts of her book and signed copy after copy for waiting fans. The story of Max reminds me of Fabi’s story, taking a chance and following your dream. A lovely story for your little ones or a feel good story for yourself. This book is bursting with colour and imagination. As the store packed up, shut down the tills and turned off the lights, the success of the night was clear, only four copies of the book were left. Read more about Fabi and her book here. Do black women want to be more like white women? Anthony Daniels on his Star Wars journey.